When the lights go down, the adventure begins! The Museum doors have been locked for the night, but in the shadows a group of exclusive recruits stand ready to begin a night of top-secret KidSpy® training. This could be you! Perfect your alias and cover-story, check in at “Border Patrol,” and prepare for a night of intrigue and adventure. As a spy school recruit, your mission begins with taking on a secret identity and gathering intelligence about real spy skills. 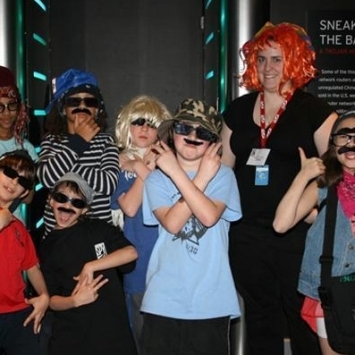 During the night, you will transform yourself through disguise, make and break secret codes, uncover important secrets, interrogate real spies, and hunt for a mole within your ranks! At the same time, the adults lurking nearby will be kept on their toes with their own super-clandestine mission. As day breaks, enemy agents will be exposed in a dramatic finale, KidSpy agents and adults will reclaim their “real” (how do we know you are who you say you are?) identities and this adventure-filled mission will be accomplished. *Operation Secret Slumber is designed for kids age 9-13.